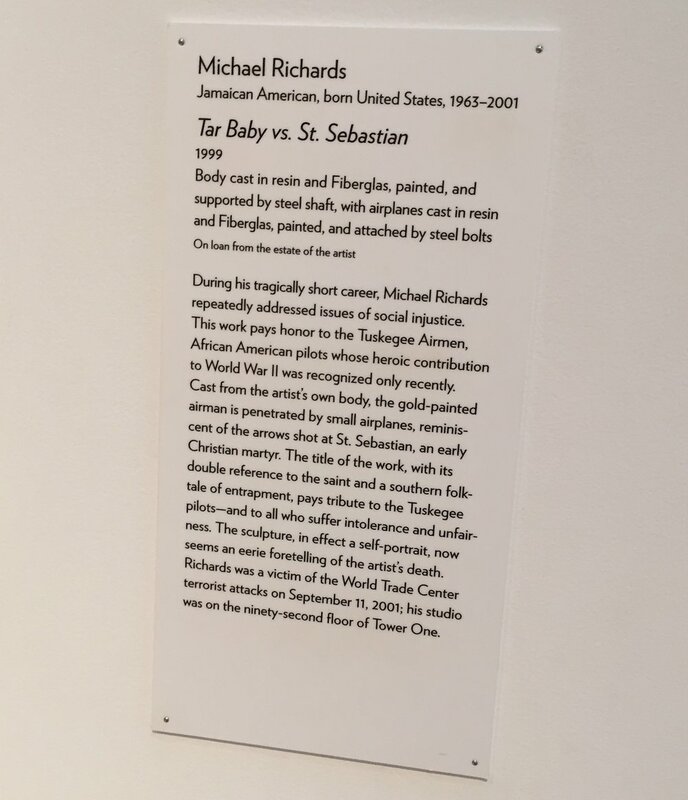 Tar Baby vs. St Sebastian, Michael Richards. On display at North Carolina Museum of Art. In the spring of 2016, I had the good fortune to visit the North Carolina Museum of Art in Raleigh. I was in heaven–a beautiful building, an excellent and varied collection and a lot of quality donor recognition to think about. As I worked my way through the contemporary galleries (personal favorites), I turned a corner and was immediately struck by this piece, a life-size casting of a man elevated well above eye-level and gleaming in metallic gold. My immediate understanding was the Tuskegee Airmen, so I looked to the small placard to the right of the display for confirmation. And that’s when the real comprehension began. The copy is here for you to read for yourself. But I ask this of my recognition clients: how much more was made available to me, the viewer, by the relative small effort it took to include this information on the wall? This museum does such a good job of basic storytelling: who, when, and what. But they add so very much more with the investment in relating the artist's intent and adding perspective only history can bring. What more should we be saying about our donors to fully reveal their relationship and impact on our institutions?